Designed by Vanessa Kwan, in collaboration with Hannah Jickling and Helen Reed. International CDN $60.00 (pricing includes shipping and handling + taxes.) International orders here. Style: Flat brim, snapback, purple and green with custom embroidery. Vanessa Kwan creates and curates temporary and permanent public artworks, hand-painted signs, drawings, collaborative performance works, programmed events and community-engaged “consultations”. Kwan is an Other Sights Co-Producer, Artist and Curator. 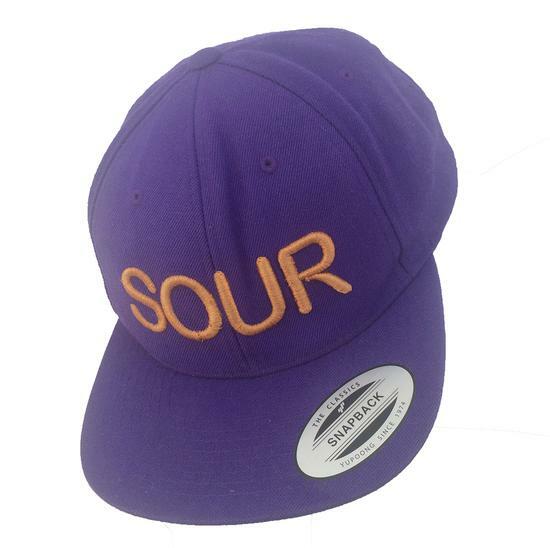 SOUR hat, was created as both response and project contribution to Big Rock Candy Mountain (BRCM). Kwan is the curator of BRCM, a multi-year residency with Queen Alexandra Elementary School and artists Hannah Jickling and Helen Reed. Big Rock Candy Mountain expands traditional notions of public art. Big Rock Candy Mountain is a flavour incubator and taste-making think-tank with elementary school students. The project takes its name from a folk song that has been revised and rewritten countless times over the past hundred years to reflect a comic utopia, where we hear a “…buzzin’ of the bees in the peppermint trees, ’round the soda water fountains.” The Big Rock Candy Mountain is a topsy-turvy world, where adults and rationality no longer define the rules and limits of what is possible. The project is comprised of a multi-faceted program of workshops, printed matter, artist editions and installations. Big Rock Candy Mountain & Other Sights gratefully acknowledge the support of the BC Arts Council Youth Engagement Program, The City of Vancouver, The Canada Council for the Arts, and the Vancouver School Board.